A collection of guided meditations and insightful teachings on the fundamental skills of being in the world. Are you looking for deeper meaning in your yoga practice? In Meditations on the Mat, popular yoga teacher and trainer Rolf Gates shares a four-part audio program to bring you in touch with the heart of yoga. Through guided meditations, skillful exercises, and down-to-earth teachings, Gates will help you attune to the spiritual dimensions of yoga—on the cushion, on the mat, and throughout everyday life. 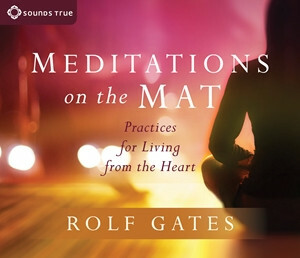 “When we can rest in the felt experience of these skills during our meditation and yoga practices,” teaches Gates, “we are better able to bring them into the more complex circumstances of our everyday lives.” For practitioners of all levels and from all traditions, these meditations are the perfect complement to any yoga or mindfulness practice.